“Vintage of the Century!” “Terrible vintage across the board!” Vintage, Vintage Vintage! UGHHHHHHHHH, enough already!!! What exactly does vintage mean anyway? Does it even matter? Should you care? With the fear of being chided, goaded, spurned, and in the end, dismissed by all my “geek” friends, I am willing to say that I believe the answer is “NO”! Okay, the answer is no unless your a major wine rag magazine with subscriptions to sell and looking for the next big headline, or your a bonafied wine geek with a cellar over 100 bottles strong. Today’s Myth Buster was inspired by an article, a book we are about to review, and my past experience selling wine in Minnesota. However, allow me to begin my soapbox lecture by pointing out the ever-so-not-humorous joke about the term: vintage. At its root, vintage matters. Vintage is the entire year in which the farmer takes vines that appear dead stumps of wood and slowly coxes them to grow leaves and bear fruit. Each year brings various weather conditions, causing the wine to taste different or exude a personality completely separate from the last one. So why would I say that you should put it out of your mind? Well, for the most part, it’s because you’re probably an individual to whom wine is not the sole focus of your life. You most likely enjoy wine with dinner or when the family gets together. Maybe your the type who likes a sip a bit of port before dinner? Either way, wine for you is a recreational activity that requires little analytical thought and is more a catalyst to help you to relax, lube the conversation with friends or even help you to woo women/men! Last month, when I was in Collioure, France with my parents, we dined at a small sidewalk cafe on sardines, anchovies and various types of seafood along with a bottle of rosé. I wanted a local wine for the local fair, so I said “une bouteille de vin rosé, si vous plait” without mentioning the grape, region, vintage or otherwise. When the wine arrived, it was wet, crisp, light, fresh and the perfect complement to our fish. In fact, it was incredible and absolutely delicious! It was a simple wine that was made for the food we were eating. In any other context, I probably would not have enjoyed it as much. My point is this, are there ways to use vintage information wisely? Sure there are. But in the end, even in the worst vintage, there are great wines made. Producer, region and style are therefore much more important when choosing a wine. But beyond all else, you need to focus on CONTEXT! Context, context, context! This is how you should buy and drink your wines. For example if we take a 100 pt Bordeaux from a legendary vintage like ’82 – technically speaking a perfect wine, but then put this same wine with the strong flavor of the Coullioure anchovies we had that day and I think you would be left tasting something akin to the bottom of a fishmonger’s sweaty foot! Foods react together in strange ways. If we evaluate it in context, we realize that the wine above might very well be the best wine you’ve ever had, but without context, it could also be the worst. When I sold wine in the States, I often had customers who would tell me, “I’m avoiding the _pick a place_ from _pick a year_ because I heard the vintage was bad.” The 1998 Californian vintage occurs to me as the one that drove us wine retailers nuts. Were there bad wines made? Sure there were. Were there good wines made? Of course there were! There were even a few great wines made which were truly appreciated by those customers who actually took time to listen to my both myself and my employees. The number one way to take the vintage completely out of the picture is for you to build a relationship with your retailer. They won’t lie to you if they respect you and want your repeat business. If the wine I sent people home with was bad, I wouldn’t have had customers. Therefore, vintage does not necessarily tell you whether a wine will be good or bad, but there is always a caveat. The caveat being that the vintage is often a good indication as to whether the wine will still be good with time. For example, if we take a light white wine like your favorite Verdejo from Rueda, it will most likely have lost its personality after only 2-3 years. On the other hand, a deep powerful red might actually be too young to be fully enjoyed in the first 2-3 years. The truth being, unless you know whether a wine will age well or not, you ought to check with someone you trust. Often, the discount bins exist in your wine shop because the wines in them are starting to push age limit and could be on the brink of falling apart. So caveat emptor, you might find a great deal or you might end up with an over-aged bottle of cork juice! In summary, when you’re at a shop, please don’t ask “Was 1997 a good year?”, and instead ask, “Does Reisling go with sushi?” If the answer is yes, which it is, then the responsible shopkeeper will help you find a good match for your dinner regardless of its vintage. 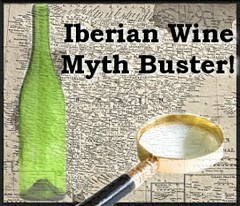 In relation to the Iberian Peninsula there are a few secret tips to understanding vintage. Think like this. Most of the regions that are located in the interior of the country are affected by a continental climate, vintage here does vary highly from year to year. Rioja, Ribera del Duero, Toro, and Rueda all have had very different vintages the past few years. On the other hand regions that line the coast tend to have, and I want to stress “tend to”, a more regular growing cycle and tend to not be effected by yearly variations as much. Jumilla, Yecla, Murcia, Jerez, Malaga, and parts of the Penedes and Cava country tend to have very regular years. One disturbing trend as of late for the whole peninsula is the trend towards hotter and hotter summers. LaMancha is practically a desert and parts of the Alentejo in Portugal are completely brown. Global warming or not something is changing and it will be interesting to see what happens in the next decade as far as where grapes can grow and mature. PS .For all the geeks out there who want to write and say that vintage does matter, remember this: You are the minority! Yellow Tail sells more wine in one year than all of your personal cellars filled with great vintages combined!